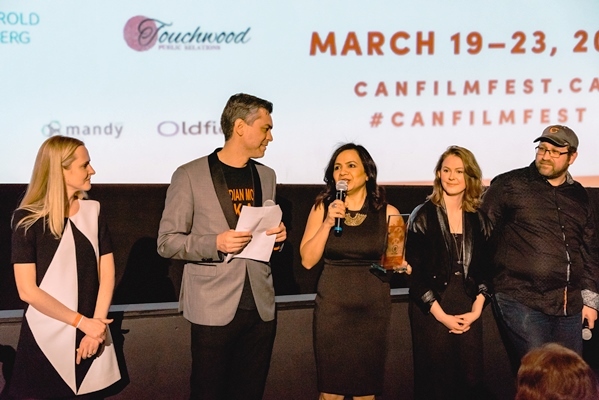 The third feature film from the accelerator program has set up shop in North Bay, ON. The third project to come out of the CineCoup feature-film accelerator program has started production in North Bay, ON. Hellmington, a “horror/thriller feature franchise,” is one of two projects greenlit by CineCoup at the Banff World Media Festival in June 2015. The $1M Big Deal Pitch Event, which completed the second round of feature-film acceleration by the company, also saw gritty teen feature High School Brawl selected to move forward into full production. Both projects received $1 million in financing from CineCoup. Hellmington is a Blair Witch-style faux documentary that follows the investigation of a missing girl in a small town. Spurred by the dying words of her father, a detective starts to uncover a series of grisly tragedies. The filmmakers behind Hellmington are Alex Williams, Justin Hewitt and Michelle Aseltine; Aseltine is also producing the project. Joining Williams as writer-director is Jay Drakulic and starring are Nicola Correia-Damude and Michael Ironside, with a guest appearance by none other than Murdoch Mysteries‘ Yannick Bisson, who, as it turns out, is a fan of CineCoup’s guerilla-indie model. Also starring are Munro Chambers, Adam MacDonald and Monica Parker. The film is produced by CineCoup in association with Vortex Words + Pictures and Blind Luck Pictures. Besides the economic benefits of shooting up North, Aseltine says that the locality’s small-town feel had great appeal for projects Canadian team, which has small-town Ontario roots. “[They] immediately bonded with the character of the town and how it could magnify the look, feel of the tone for the picture,” she told Playback Daily. Production kicked off Tuesday morning and the film is slated to roll out in Cineplex theatres – the distribution deal is part of the CineCoup model – in 2017. The first feature out of the CineCoup model was 2014′s Wolfcop, which spawned a sequel, WolfCop 2, which is currently in post-production.